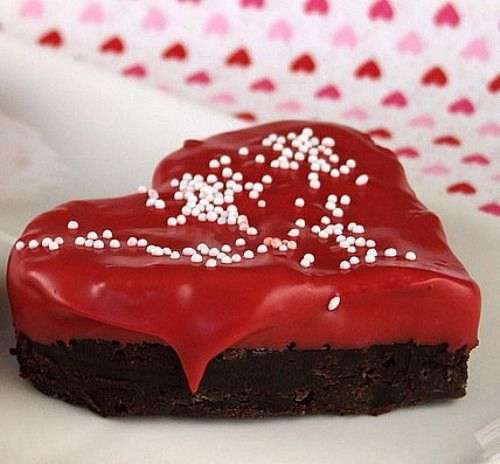 10 Brownie Heart Recipes For The Valentine’s Day! 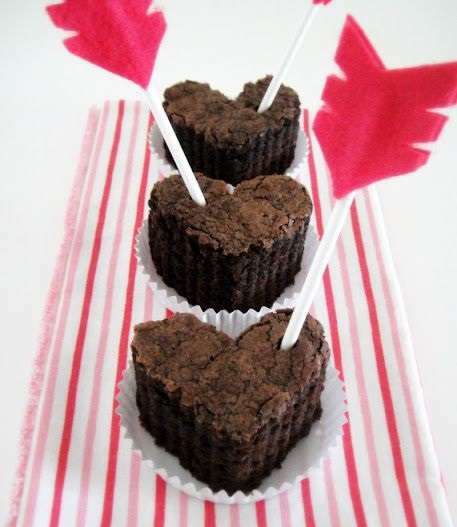 Brownie hearts are one of the most popular and best dessert that you can make for the Valentine’s Day. 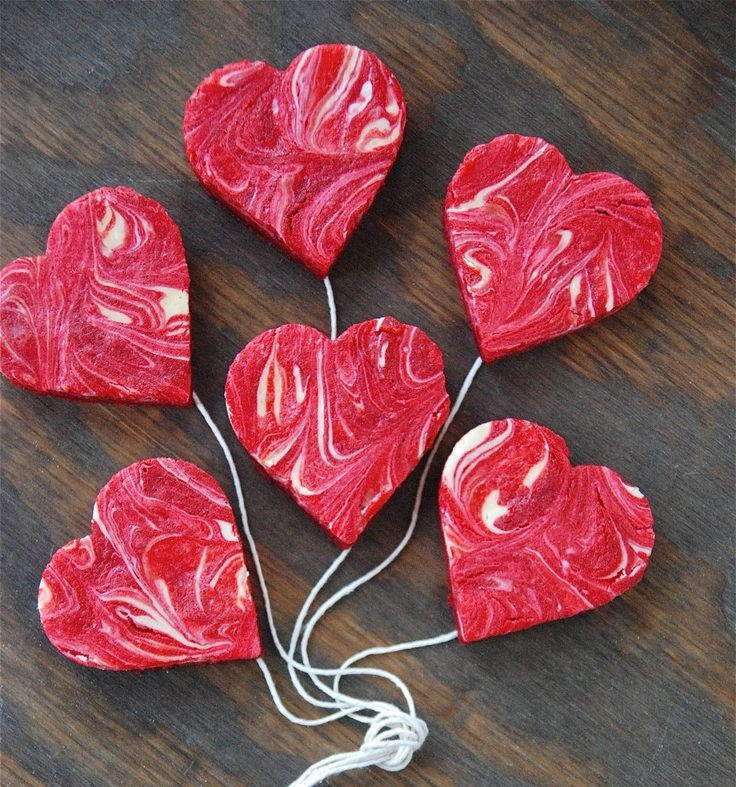 It’s pretty easy and fast to make so whenever you are thinking about something sweet to add after your dinner, you can instantly make these brownie hearts and enjoy the shape of it. 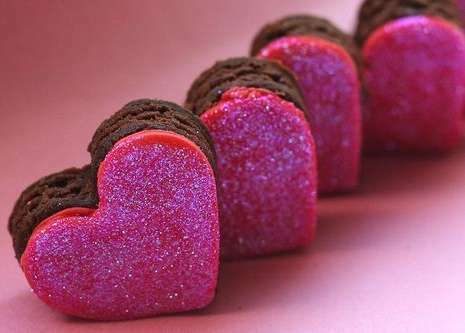 Brownie hearts are nothing more than brownie but in heart shapes. 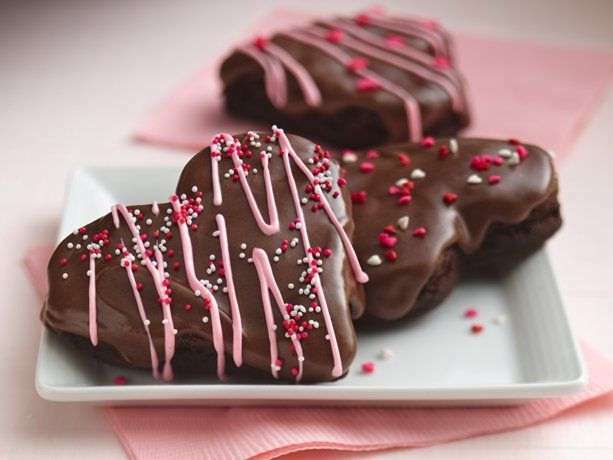 So to make these brownie hearts, all you have to do is know a perfect recipe for brownies and then cut out the pieces by using a heart shapes cookie cutter. To get one of the easiest recipes, you can start with this one where you will need ½ pound unsalted butter, 2 ½ cups packed light-brown sugar, 6 ounces unsweetened chocolate, 4 large eggs, 2 tsp vanilla extract, 2 cups flour, ½ tsp salt and confectioner’s sugar, granulated sugar, cocoa powder for coating bites. Start with preheating the oven to 325 degrees. Butter a 9×13 inch cake pan. Cut a piece of waxed paper to fit the bottom. Press it onto buttered surface. Combine butter, brown sugar and chocolate in a large microwave safe bowl. Microwave on high for 1 minute and stir. If the chocolate is not softened, continue to microwave at 10-second intervals. Remove it before it gets completely melted. Now beat the eggs and vanilla into the melted chocolate with a wooden spoon. Beat in the flour and salt. Pour into prepared pan and smooth the top. Bake until a toothpick inserted in the centre comes out almost clean which will take around 35-40 minutes. Let it cool. Run a knife around the edge of the pan. Turn the brownie cake out onto a baking sheet and flip over onto a work surface. Cut out the brownies with a 2 ½ inch heart shapes cookie cutter. Dust with cocoa if you like and then form the scraps into 1 inch balls. Roll them in the coating of your choice. And you brownie hearts are ready to serve! 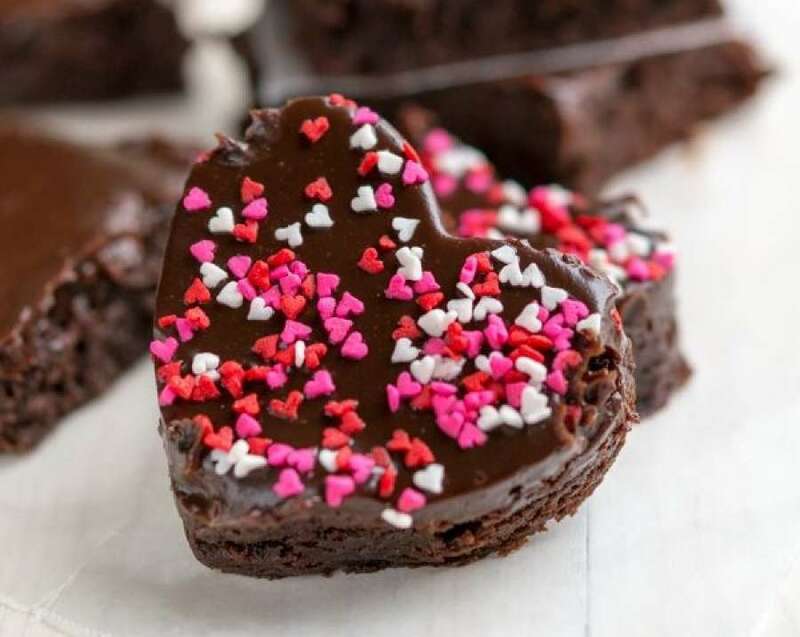 To make a fancy one, you can make this recipe of traditional glazed brownie heart where you will need 1 box Betty Crocker fudge brownie mix. You have to add the required amount of water, vegetable oil and eggs for the brownie as instructed on the box. You will also need 1 container Betty Crocker rich & creamy chocolate frosting. For decorating, you will need Betty Crocker decorating decors multicolored candy sprinkles or colored sugar. Start with heating the oven to 350 degrees F. Line bottom and sides of 13×9 inch pan with foil. Grease foil on bottom only of pan with shortening or cooking spray. Make and bake brownie mix as directed on box. Cool complete for about an hour. Using foil to lift, remove brownie from pan and then remove foil. With deep 2 ½ inch heart shapes cookie cutter, cut 14 brownies from it. 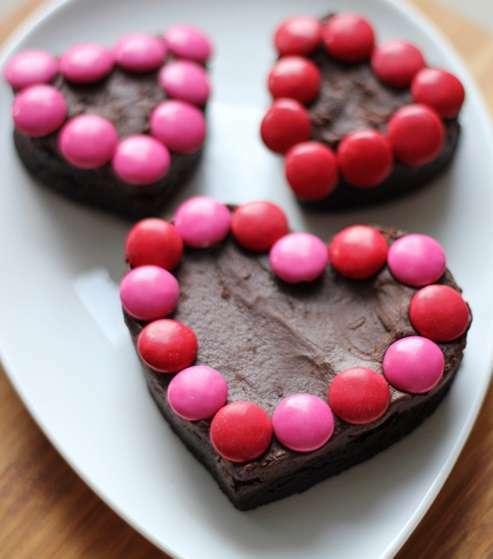 Place brownie hearts on a cooling rack or waxed paper. Microwave frosting uncovered on high for 10 to 30 seconds in a microwave bowl. Stir the frosting and make it thick and spoonable. Do not boil the frosting and then carefully spoon melted frosting over brownies to glaze. Allow excess to drip down sides and sprinkle with candy sprinkles before frosting sets. 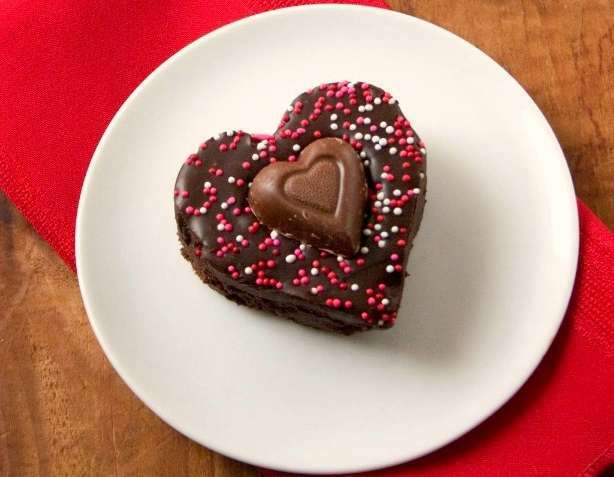 Your traditional glazed brownie hearts are ready to serve. The recipes are quite easy, aren’t they? All you have to do is mix all the ingredients and then bake it followed by cutting out the heart shapes. The ingredients are also so common that you might already have them all in your kitchen. Heart brownies doesn’t need to be made of Valentine’s Day only. 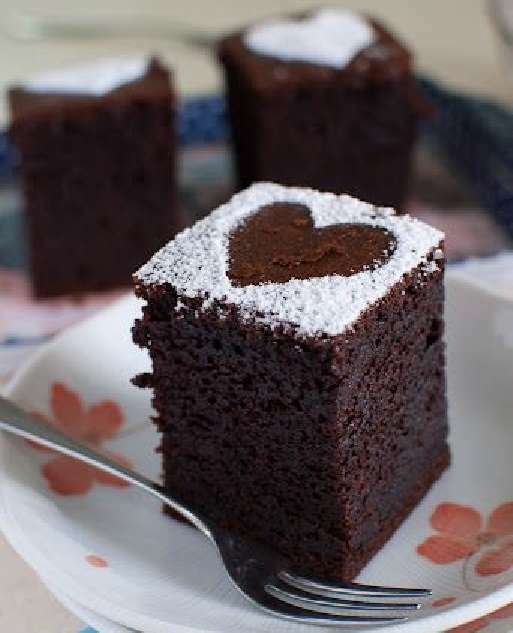 You can also make them on a regular day to and serve these cute heart brownies to your loved one after dinner to make those moments more special. 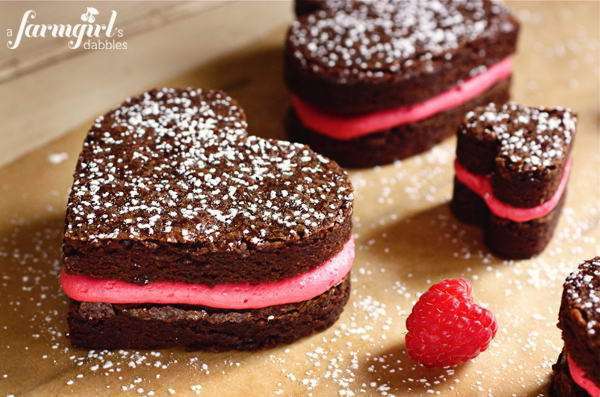 So when are you going to make some of these heart brownies at your home?